Hello dollies! 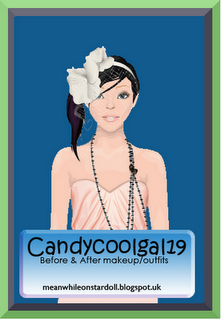 I am candycoolgal19, your new before and after makeup/outfit writer. I hope you enjoy my first post with iluvladygaga232! I am not a really big fan of the hair and lips. 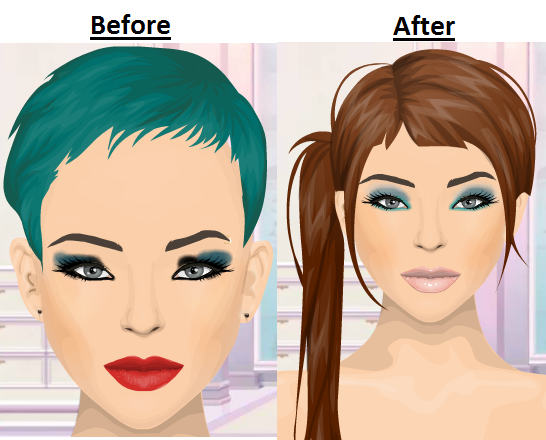 I changed her hair into a natural colour and put lipgloss on for a little shine. I decided to make the eyes the centre of attention by using a beautiful blue which stands out from the 'natural' face. I think her outfit is okay but the shoes are funny looking. In my outfit I used a blue top which would compliment the blue eyes I did for her in the makeover. I used a beige skirt and black accesories which matched the zippers in the skirt. Can you do one on me?